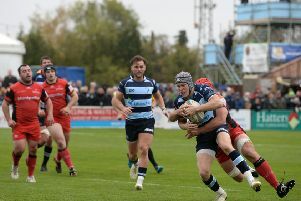 The Blues Academy beat the Royal Navy U23 XV 9-0 in a low-scoring affair at a very wet Goldington Road. Bedford dominated the first 20 minutes but failed to score as a combination of poor ball retention, poor decision making and good Navy defence kept the score sheet clean. The Navy weathered the storm and pushed into the Blues half, and had a couple of penalty chances to score but missed narrowly, leaving the score 0-0 at half-time. The second half was more even territorially but it was the Blues who managed to score with two penalties from full-back Liam Shields and one from winger Scott Lyle, to give them a 9-0 win. Blues Academy director Denis Ormesher said: “Conditions with a wet greasy ball made it difficult for both sides. We should have had two or three scores in the first 20 minutes but took a few wrong options. The Blues Academy play away on Saturday against the RAF U23 XV. The game is at RAF Halton in Aylesbury, Buckinghamshire and kicks-off at 2pm.